Well, it's finally Friday night -- I thought it would never get here! Tonight I was in the mood for "white pizza"...which is essentially a pizza without red sauce; just cheese, garlic and herbs. If you've never had it before, it is really good and a nice change from the regular "tomato sauce & cheese pizza". I also had a bag of fresh spinach that I wanted to use so rather than serve spinach salads on the side I decided to lightly saute and wilt the spinach in some garlic infused olive oil and add that to our pizza instead. So...what we ended up with was "Green & White Pizza". 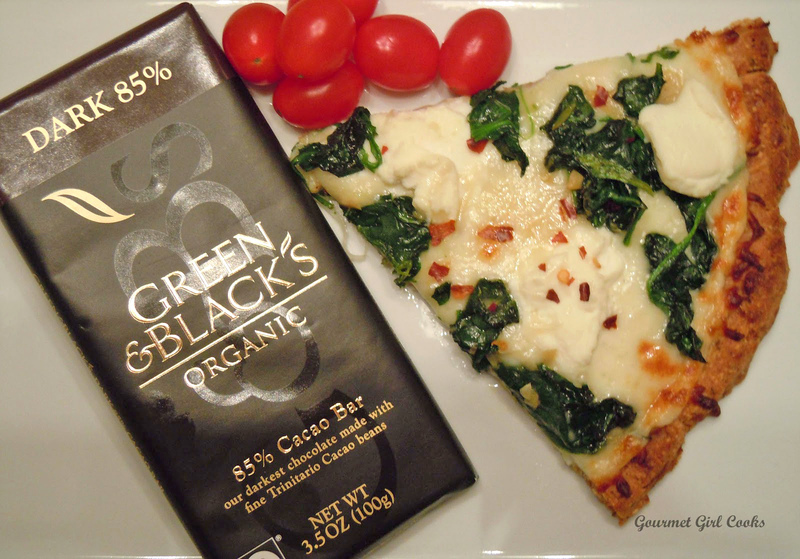 I thought that the perfect (and simple) dessert to accompany the Green & White Pizza dinner would be "Green & Black's 85% Chocolate"! 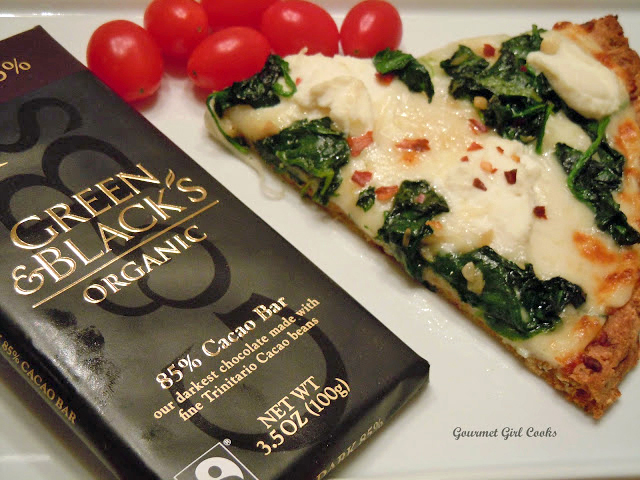 I thought they would go together like salt & pepper and what better way to end the week than pizza and chocolate! :-) Now, don't worry...I didn't eat the entire chocolate bar, only a small piece...and I didn't eat the entire pizza either -- only 2 small pieces of that. It was absolutely delicious and so simple to make. I used my Almond/Flax/Parmesan Herb Pizza Crust as the base for my pizza. After making and pre-baking the crust, I brushed the top of it with some garlic infused olive oil. I scattered freshly shredded mozzarella cheese on top and dropped some little dollops of ricotta cheese over the mozzarella and sprinkled it with a couple teaspoons of Parmigiano Reggiano and then added the wilted fresh spinach. I popped it into the oven to finish baking for about 10 minutes. After pulling it out of the oven I sprinkled some spicy red pepper flakes on top. It was like being in a cozy little Italian bistro instead of my kitchen table! I snapped a few photos below for you to see and the recipe for the crust is linked above. Enjoy! I must try this Pizza, it looks great. The green and black chocolate is also a favourite in the family. 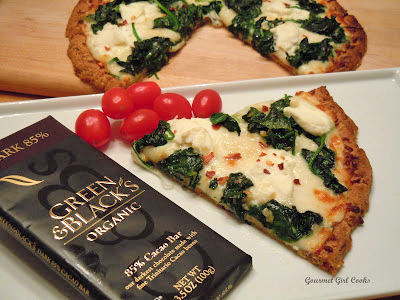 Hi Sami...I hope you enjoy the pizza -- I really like it -- you could also make it without the spinach too if someone doesn't like it. Thanks! And the Green & Black's ... perfect! Will be enjoying this soon. I also use the Almond/Flax/Parmesan Herb Pizza Crust to make crackers. I use a little more Parmesan and roll or press it thin and bake, cut and separate and place them back in the over with low heat to dry them out more. EXCELLENT! Thank you for our work.